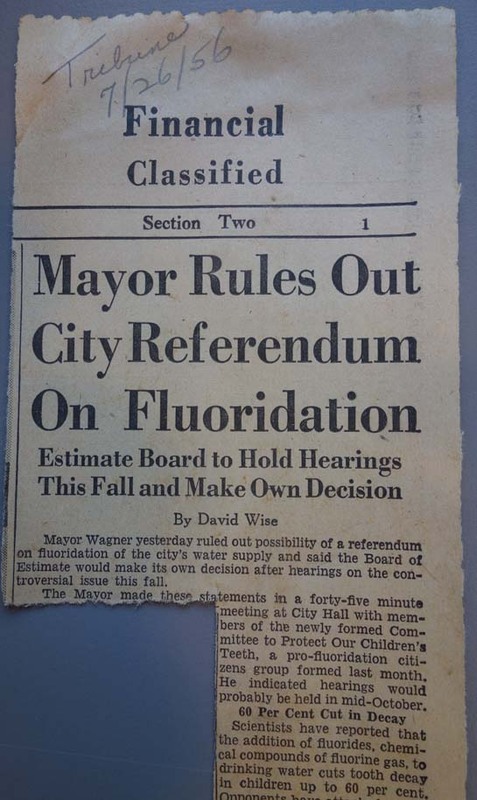 February | 2015 | "An Adventure in Democracy"
Thanks to the collection’s files on fluoridation (which generated an article Feb. 24 for The New York Times http://www.nytimes.com/2015/02/24/health/new-yorks-fluoridation-fuss-50-years-later.html?ref=science) we know how Gulick prodded his good friend Mayor Robert F. Wagner to stop dithering and take a stand for fluoridating New York’s water. 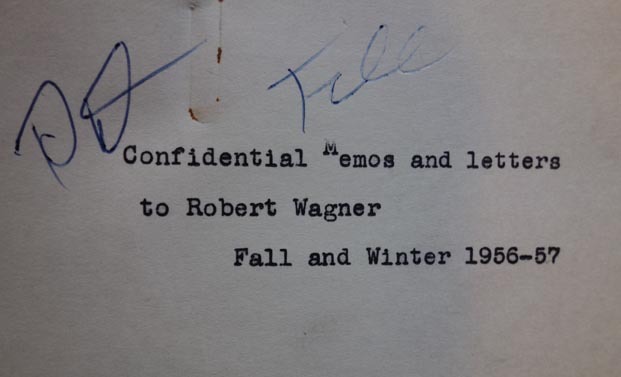 (Wagner had always taken his Senator-father’s advice to heart: When in doubt, don’t.) 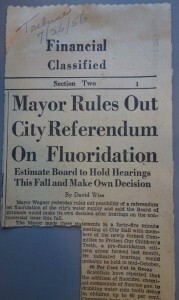 It took eight years but fluoridation finally came to New York in 1965, 50 years ago this October. https://blogs.baruch.cuny.edu/ipaprocessing/wp-admin/post.php?post=1591&action=edit Half a century later, it remains a hot button issue around the globe. Now we find Gulick also behind the scenes counseling Wagner on his political ambitions, namely trading City Hall for a seat in the United States Senate — the seat his late father, Robert F. Wagner Sr., held from 1926 to 1949 — and who knew what beyond? 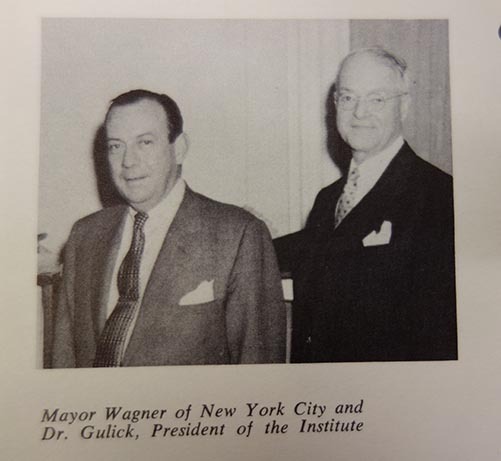 Here’s the background: In 1956, Wagner was in the third year of his first term as Mayor. (He would serve three terms, along with Fiorello LaGuardia, Edward Koch, and Michael Bloomberg, but that’s getting ahead of ourselves.) 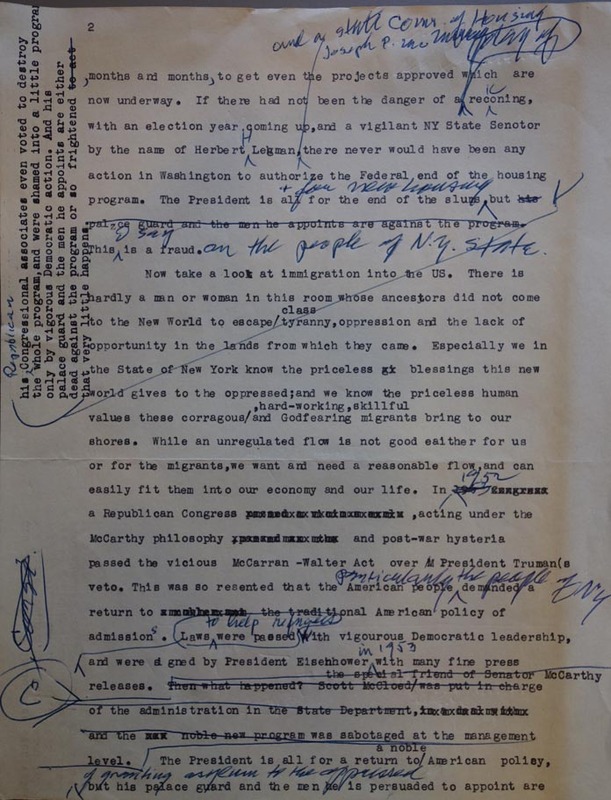 In 1956, a prize Senate seat from New York opened up with the retirement of Herbert H. Lehman, Franklin Roosevelt’s successor as Governor of New York who had taken Wagner senior’s place after he resigned for ill health. 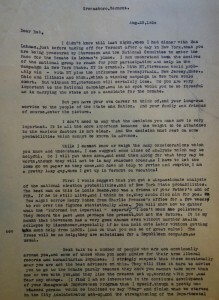 Lehman and Gulick had a long connection, having worked closely together on refugee relief issues during World War II. For the ’56 campaign, headed nationally by President Eisenhower and VP Nixon seeking reelection, the Republicans, eager to pick up a second Senate seat from the Empire State, put up New York State Attorney General and former Congressman Jacob Javits. 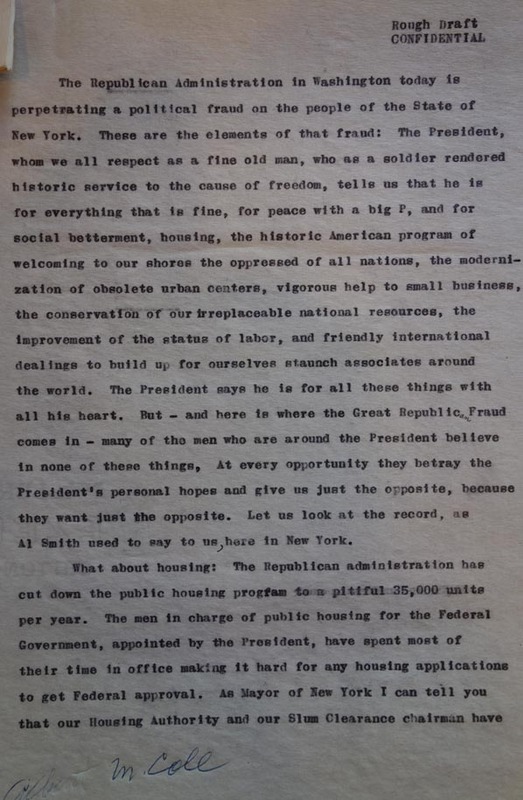 But although Wagner would not be risking his city job to run — he would not be up for reelection as mayor until 1957 — he characteristically hesitated. 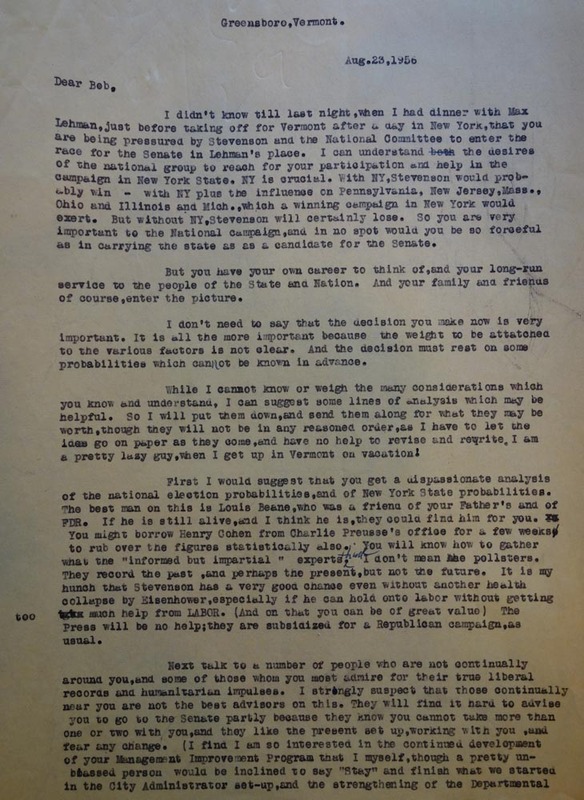 According to a revealing letter from Gulick, the Democratic National Committee and Presidential candidate Adlai Stevenson (making his second run for the White House after losing to Eisenhower in 1952) were pressuring Wagner to become their Senate standard-bearer in New York. To win, they needed New York, and Wagner was a charmed Democratic name. But was a Senate race good for Wagner? 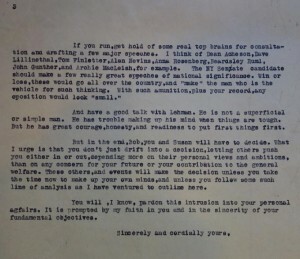 Gulick shrewdly weighed the pros and cons. 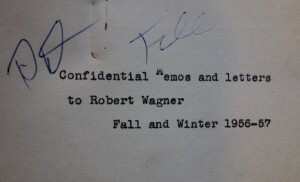 When he calmed down, Gulick produced a cleaner copy for Wagner. We know how the story ends: Javits swamped Wagner by almost 460,000 votes. 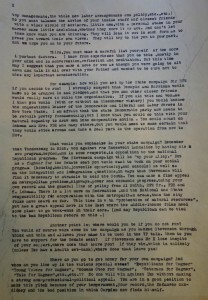 Wagner went on to run and win again for Mayor in 1957, and a third time in 1961. Meanwhile, however, he flirted with another run for the U.S. Senate in 1958, to challenge the GOP neophyte, Kenneth Keating. But this time Wagner took his father’s advice. He was in doubt — and didn’t. (Manhattan District Attorney Frank Hogan ran as the Democrat, losing to Keating by nearly 400,000 votes). 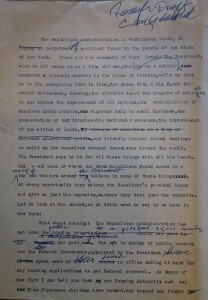 Gee, you never know what you’re going to find in the archives. 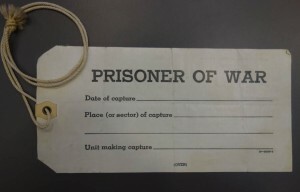 Alex opened a box and found this — a US Army tag for captured World War II prisoners, dated 1942. Here’s the flip side (in English, German, Italian and Japanese). 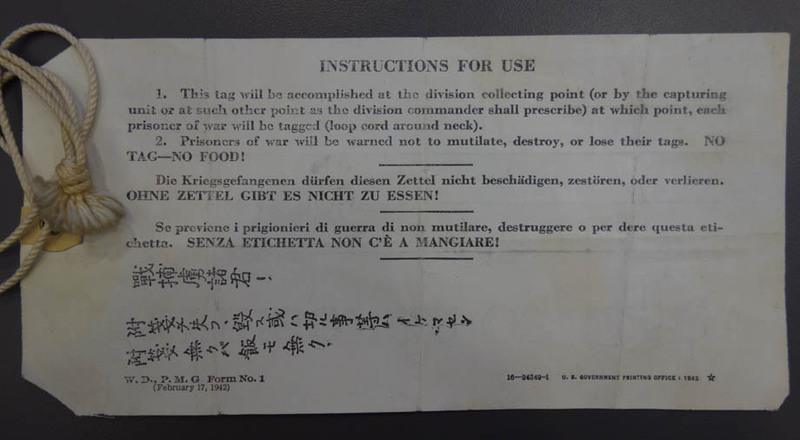 Get this: “NO TAG –NO FOOD!” Uncle Sam wasn’t fooling around. 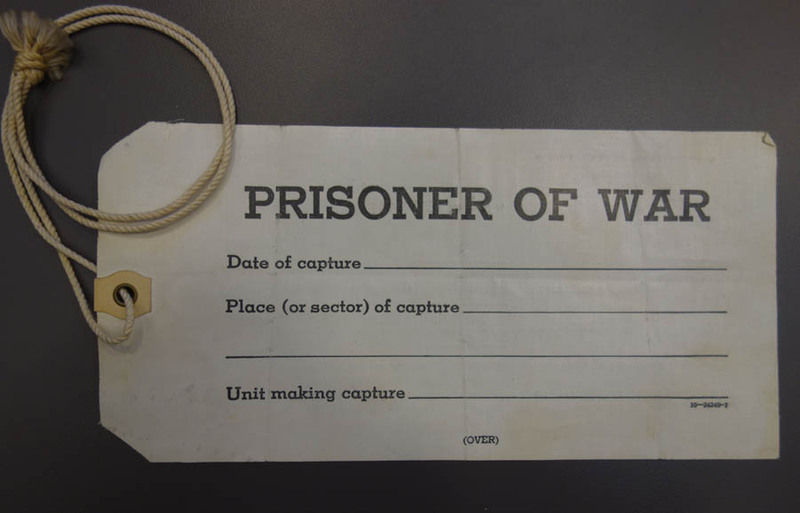 We didn’t have many prisoners yet — months after Pearl Harbor, the war was going very badly for the Allies indeed. But we were ready with the tags, just in case. So how did one end up in the Gulick/IPA Collection? It’s not clear but we know that Luther Gulick traveled to conquered Germany in 1945 with President Truman for the Potsdam Conference to plan the peace with Stalin and Churchill. There were some other interesting artifacts in the box. 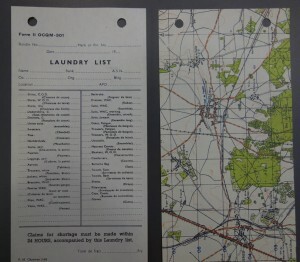 Laundry lists — printed on the backs of French maps (to save paper). Hey, everyone needs clean underwear. 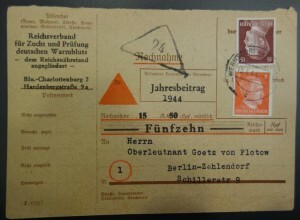 And here’s the most intriguing thing: a mailing label from 1944, with Hitler stamps of course, addressed to a German diplomat and officer, First Lieutenant Goetz von Flotow. (The back was blank.) 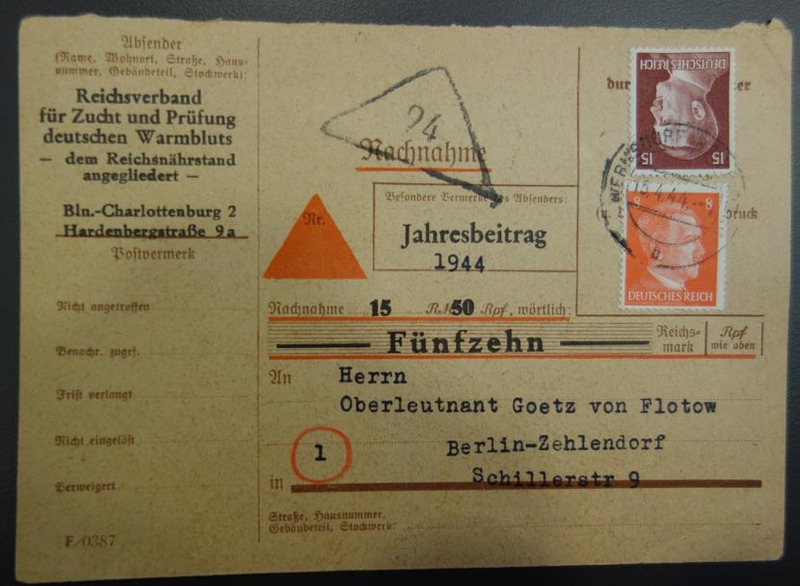 The return address looks serious, beginning with Reichsverband, or Imperial Association…for…The Care and Testing of German Warmbloods, Division of the Imperial Food Production Authority. So the von Flotows were keeping or breeding racehorses. Diligent readers of the blog (you know who you are) will remember the strange episode of “Looter” Gulick’s Max Liebermann painting that he was safekeeping for the family of von Flotow and, after he died in 1947, his widow, Hildegard. That didn’t sit too well later with an Assistant Attorney General in the US Office of Alien Property. 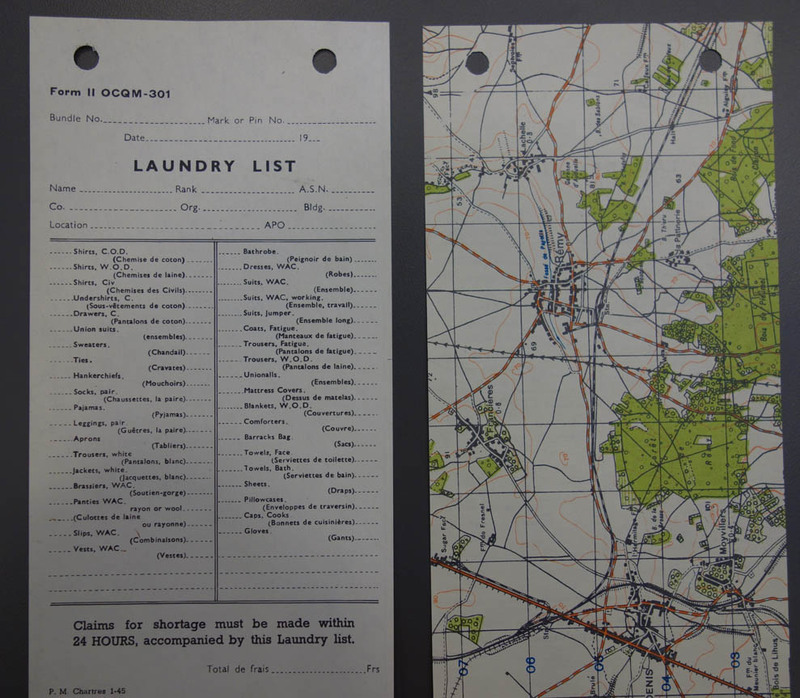 There were strict rules about private acquisition of enemy assets. 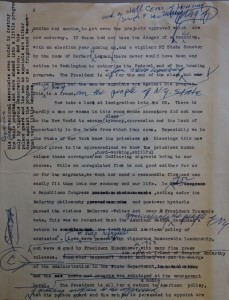 Gulick had an innocent explanation but ended up surrendering it for auction by US authorities. 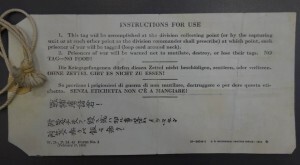 But how did Gulick come into a possession of a document from von Flotow from 1944, when the war was raging and well before he had the disputed painting? That we don’t know. One guess: Gulick liked to collect souvenirs. Perhaps when he was there in 1945, he found, or was given, the label and, with the painting already in hand, held on to the label as well. 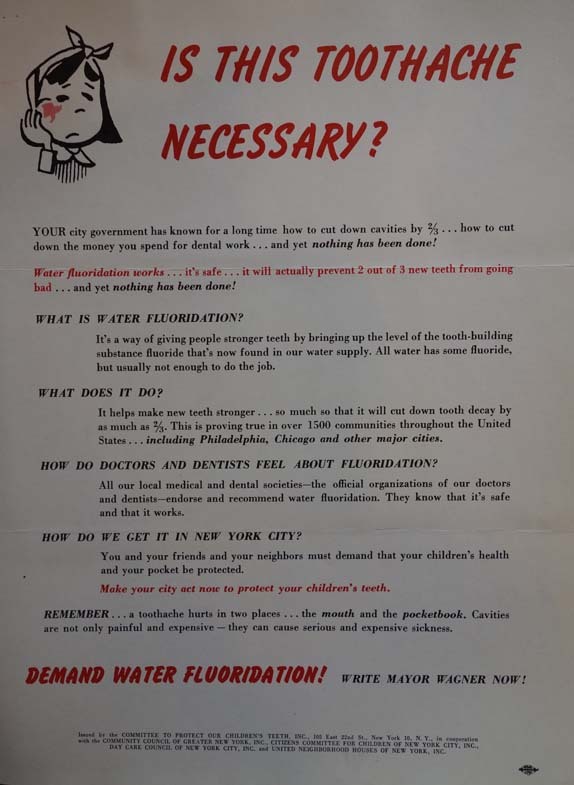 Fifty years ago this October, one of the hardest-fought battles of the cold war ended with the turn of a faucet — New York City taps were finally running with fluoridated water. Luther Gulick, a key member of the Committee to Protect Our Children’s Teeth — as the advocates under Dr. Benjamin Spock had styled themselves –played a major part in that victory, using his skills as a public administrator to marshal the scientific evidence and persuade his hesitant friend Mayor Robert F. Wagner to take a forceful stand against opponents raising claims of danger and forced medication and clamoring for a referendum (where fear would likely carry the day). That story will be told elsewhere. But here is an intriguing nexus. 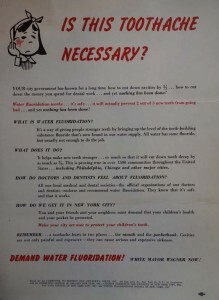 Baruch’s Newman Library housing the IPA Collection of the Gulick papers, with files on the fluoridation controversy, is also home to another historic collection on loan from the Museum of Public Relations. 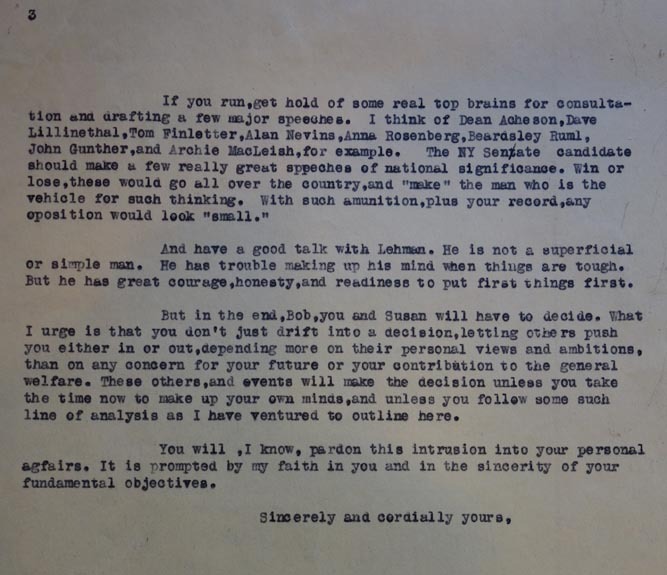 The prospect of two great collections buttressing each other in the Newman Library archives sent us rushing to the shelves of books by and about Bernays. Did the fluoride industry really use fluoridation to change the chemical’s image from “poison to panacea”, as Bryson’s book put it? 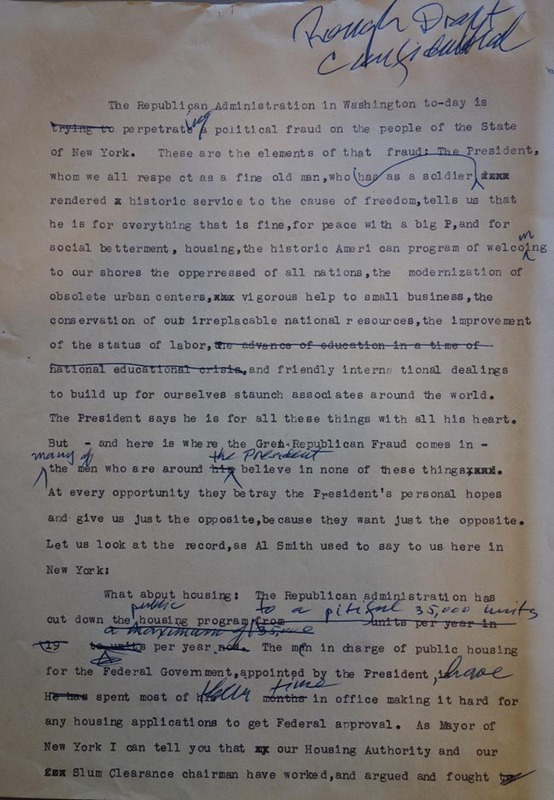 Alas, evidence in the Bernays materials at hand was scant. 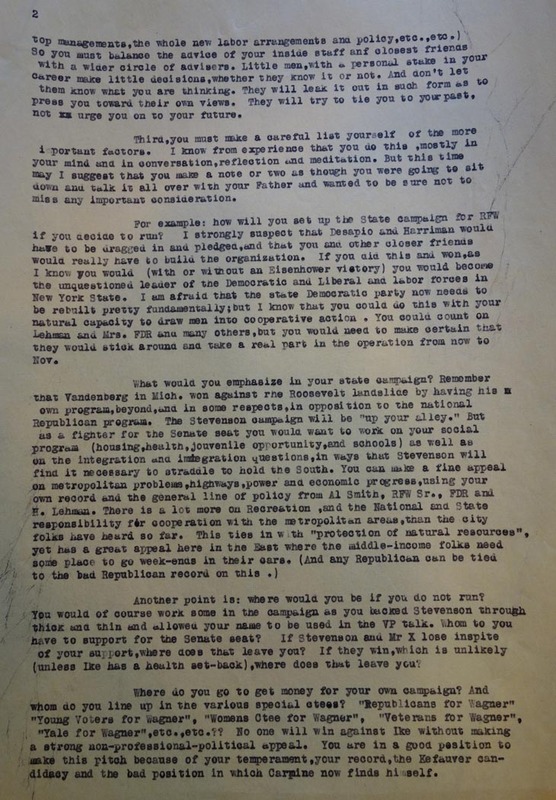 Suspiciously or not, Bernays, seemed to steer clear of fluoridation in his writings. 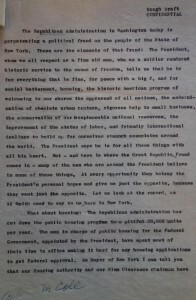 The record, Bryson writes, is to be found in Bernays’s letters in the Library of Congress.